IMG_3709, originally uploaded by pengellyplace. Each winter our Waldorf school holds a Winter Faire. One of the attractions is the Children's Only Store. Parents of Class 6 (and often others) provide craft items that the children of K-8 can buy for very very reasonable prices as gifts for their Moms and Dads. This year my youngest is in class 6. These pens are my contribution. I haven't decided on a name for them yet. Jingle pens? Wish list pens? Fairy pens? If you have a good suggestion leave me a comment! 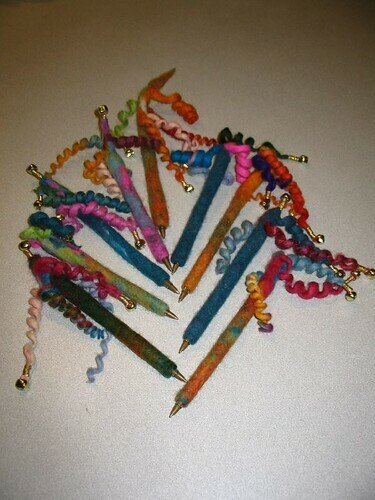 They're fun and beautiful - "Gelly Pens!" Thanks for the idea and the compliments.